posted: July 21, 2014 by: Lynelle T. Ayotte Tags: "Clinic Specials" "News"
Recently I have reviewed the American Heartworm Societyâs updated guidelines for heartworm in cats, and have updated my own recommendations for prevention of this very serious disease. Heartworm disease in cats is spread by mosquitoes, and can vary in severity from having no symptoms, to sudden death. 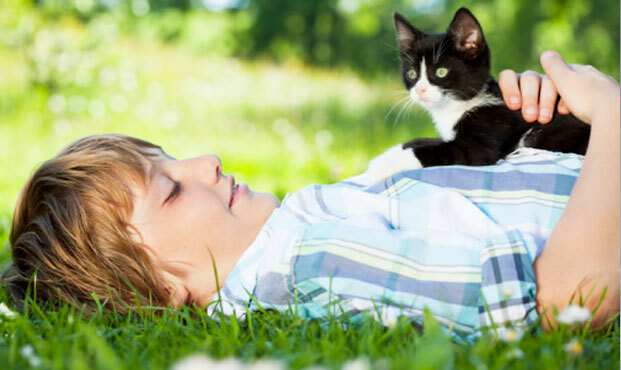 While it is true that the likelihood of heartworm infection is lower than in dogs, the risk of heartworm in cats is a very real risk in Connecticut. This is because we are seeing an increase in heartworm in dogs, and infections in cats are directly related to the number of infected dogs in the area where the cat lives. Outdoor cats are high on the list for risk of exposure. However, while it is tempting to feel that an indoor cat is not exposed to this risk, this would be incorrect because mosquitoes do get into homes. For this reason, I am recommending all cats start monthly heartworm prevention and protection. Unlike with dogs, testing prior to starting prevention is not required. The product that I am endorsing is Revolution, which is a topical application which protects against heartworm, as well as fleas, intestinal parasites, and off label protection against ticks. This product is available in our office, or if you prefer, by prescription. And, if you wish to begin Heartworm prevention in your cat, or if you have any specific questions about Heartworm, please feel free to contact our office.